As retailers increasingly spread sales and discounts throughout November, it has become a shopping extravaganza. As Black Friday fades in importance, analysts and consumers are realizing they need a new name for the steep discounts shoppers enjoy ahead of the holiday season. An ominous-sounding winner has emerged. "It's no longer Black Friday," Marshal Cohen, the head retail analyst at NPD Group, told The Boston Globe. "It's now Black November." As retailers increasingly spread sales and discounts throughout the month, November has become a shopping extravaganza. Online sales from November 1 through 22 totaled almost $30.4 billion this year, accounting for nearly 18% year-over-year growth, according to Adobe Analytics. In fact, every day in November so far has seen over $1 billion in online sales, creating a new paradigm for shoppers and retailers. Black Friday remains one of the biggest shopping days of the year, but now it shares the spotlight with Thanksgiving, Cyber Monday, and the two weekend days in between. Thanksgiving is now the third-biggest shopping day of the year, behind Black Friday and Cyber Monday, according to Salesforce. 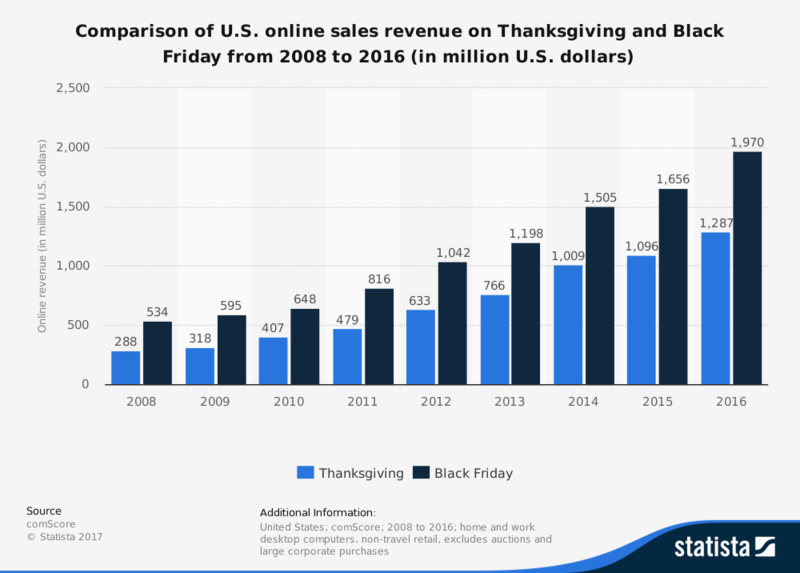 Online spending on Thanksgiving was up 29% this year compared with last year, according to data from Salesforce, whereas last year it increased only 17% over 2015, suggesting that the holiday is quickly becoming a shopping event. Black Friday sales events are starting earlier and earlier in November every year as retailers try to get the jump on one another. The terms "Black Friday week" and "Black Friday weekend" seem more prevalent. This year, Target had online Black Friday deals for holders of its credit card on November 22, two days before Black Friday. On November 1, Amazon launched its Black Friday store, and Sears put all the items in its stores on sale. And the sales on Black Friday aren't any better than those earlier in November, according to analysts at Instinet. Another reason for the death of Black Friday is the ubiquity of shopping on smartphones, enabling shoppers to browse and purchase online anywhere and anytime. African nations are powering up the business rankings. What lessons can we learn from them? Phones accounted for 46% of all retailer traffic on Thanksgiving, according to Adobe — an increase of more than 15% over last year. At the same time, traffic from tablets and desktops decreased, making mobile the most popular option for Thanksgiving shopping for the first time. Cyber Monday is also on track to become the biggest US online shopping day ever, driven by mobile purchasing and the ease of payment services like Apple Pay, Adobe says. Black Friday isn't just a day anymore — it's a whole season.